Check out why Rinnai RL94 tankless water heaters are the most popular non-condensing models. Find out how Rinnai tankless water heater heats water fast, delivers hot water on demand, continuously and in an endless supply. Discover the most advanced features and specs, such as the recirculation technology and high water flow rate, and how it can improve your lifestyle. Rinnai tankless water heaters from RL94 series are coming from the non-condensing but the high efficient group, similar to V series, but with an improved design, and not as advanced as models from RUC and RUR series. The main differences between the economy V models and RL series, including the RL94 that we are reviewing here, is the Circ-Logic recirculation technology, which gives them the ability to deliver hot water faster, isolation valves for easier and faster installation and service and voice activation system, which is straightforward. RL94 models are built for indoor and outdoor installation and can use either natural gas or propane. To see which one of the above models is for you, it depends on your preference and installation viability. The recommendation is to get a natural gas model which is cheaper to use and install it indoor for convenient use and still safe as the outdoor. Indoor models are designed to utilize a direct venting system and vent the exhaust gases out safely while taking the fresh air in for proper gas combustion. They are designed with the sealed combustion, and with the modern and sleek design are perfect for installation in the bathroom or kitchen. No need for the utility room as required for installation of the storage tank-type heaters. Rinnai outdoor models RL94e are ventless; they do not require a venting system and are installed outside only, usually inside the recessed enclosure for protection. All the tankless models are small, compact and wall mounted, so no floor space is required. These models provide a continuous supply of hot water, any time at the preset temperature and when the hot water tap is open. Within the Luxury group, there are also Rinnai RLX models that are the same as RL models but are built for indoor use and powered by natural gas only, while complying with the strict NOx emission standards - known as ultra-Low NOX. The maximum power it can achieve is slightly lower than the power of RL94i, it is 192,000 BTU, while the minimum is the same. Both Rinnai indoor RL94i and outdoor RL94e models belong to the "Luxury" or SE+ series and are recommended for homes with the high demand for hot water. 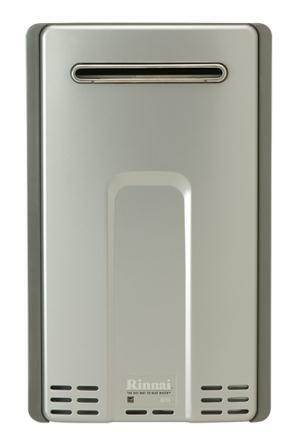 The maximum water flow is approximately 9.8 gallons per minute, so the units can supply hot water to up to five applications simultaneously, while the minimum activation flow rate is 0.4, which allows small jobs such as hand washing, shaving... For higher demanding homes where higher flow and power is needed, Rinnai RL94 models can use the EZConnect cable to connect two units. Rinnai RL94 tankless water heaters are equipped with the 24-hr programmable digital controller for extra convenience and diagnostics. The controller is built into the front panel, and it provides easy monitoring, temperature control, and troubleshooting - using the error codes. The error codes, such as 02, 03, 11, 12, 31... would display on the LCD screen showing what is wrong with the water heater, so the user or technician can fix a water heater faster. The temperature of the outgoing hot water is continuously monitored by the advanced electronic board, which adjusts the water flow to maintain the set temperature. All the components are made of the quality materials, including the heat exchanger which is made of the commercial grade copper. Due to the high quality of heat exchangers, Rinnai provides 12-year warranty ensuring its resistance to the high mechanical and thermal stress. This is why Rinnai water heaters from the "Luxury" series can be used not only in residential water heating but manufactured homes and commercial applications. A gas modulating burner allows a water heater to work with the power ranging from 10,300 to 199,000 BTU using both natural and propane gas, and provide hot water with the temperature between 98 F and 140 F. Modulation is what significantly reduces annoying temperature fluctuation, also known as “cold water sandwich”, providing better user experience and savings up to 40% in the energy. With the built-in Rinnai Circ-Logic feature, RL94 models can use the external pump and dedicated recirculation line for faster hot water delivery to the faucets. This is resulting in better efficiency and comfort, and of course happy customers. 12-year limited warranty on the heat exchanger, 5-year on other components and 1 year on labor. Rinnai RL94 series is compatible with Rinnai digital controllers so you can set hot water temperature precisely for multiple locations in your home. Enhanced scale detection reduces scale build-up. High altitude operation - up to 10,200 ft. Integrated condensate collector makes the maintenance easy. No more pilot light; direct electronic ignition is reliable and convenient. Gas and water fitting sizes are 3/4", also 1/2" gas line compatible. Water pressure range is from 20-150 PSI, recommended is from 30-80 PSI. Rinnai RL94 models can be used in the hydronic application and mobile homes. Isolation and pressure relief valve included for easy maintenance. All the components are replaceable, so whatever element malfunctions, it can be replaced. Small size with the dimensions of 9" x 14" x 23". The lightweight design of approximately 46 pounds. Wi-Fi ready for remote control and monitoring. 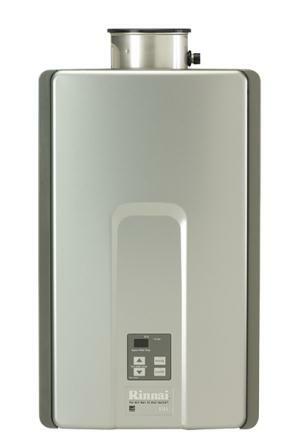 Rinnai RL94 tankless water heaters are ideal for large homes and small businesses, delivering hot water to 3-5 fixtures at the same time. They are recommended in both point-of-use and whole-house heating applications. As opposed to condensing models, RL94 comes with only one heat exchanger, which makes them non-condensing, and with the built-in advanced technology, homeowners can enjoy on-demand heating and endless hot water for less. They last, protect, save, ensuring maximum convenience and comfort. If you don’t need such a powerful device, but would like to have the same features and pay less, you can get Rinnai RL75 instead; powered by natural gas or propane, installed indoor or outdoor and use it in homes with 2-4 bathrooms.